Approximately 40 percent of Israeli settlers’ graves in the occupied West Bank were built on privately-owned Palestinian land, an Israeli survey published on Sunday . A survey published by Haaretz revealed, according to Al Ray, that more than 600 graves, on 10 settlements, were built on privately owned Palestinian lands in West Bank that Israeli occupation authorities expropriated. According to a study by the left-wing Kerem Navot, the grave of Rabbi Raziel Shivah, who was shot dead in early January, near Nablus, was built on disputed land near the settlement outpost of Havat Gilad. According to the study, there are more than 33 Israeli cemeteries in Israeli settlements , some of them are small while others are main cemeteries. The study pointed out that about 1,400 settlers were buried in these cemeteries, most of them on Palestinian lands. Two main cemeteries were built in Hebron and Kafer Etzion, on Palestinian lands that were bought by Israelis in 1948. The graves, built on private Palestinian lands near the settlements of Beit El, Ofra, Psagot, Ma’aleh Mishmash, Alon Moreh and Kiryat Arba, where the grave of Baruch Goldstein is located. 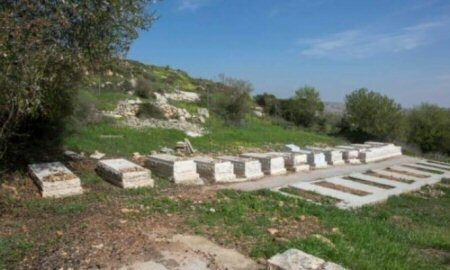 According to the study, some of these graves were built on land confiscated under security pretexts, and some of them sit hundreds of meters away from the homes of settlers within those settlements, so as not to be removed or to be handed over to the Palestinian owners. The Israeli Civil Administration refused to explain if it had given permits to build these graves on private Palestinian land.